The Julie James Show featured in Playbill: What Not to Miss This Week in Nightlife! Featured on this week’s Playbill “must see” list for “The Julie James Show”! USE CODE: JJSHOW20 for 20% off! Hailed in the press as “the reigning queen of the Broadway party” following 2 prior sold-out performances, Broadway personality and SiriusXM Radio “On Broadway” host Julie James will present a final encore of her musical comedy, The Julie James Show, on Monday, October 19th at 9:30 PM at Feinstein’s/54 Below, it was announced today. To Broadway performers, fans and “On Broadway” listeners, Julie is best known as the effervescent host of “Broadway Names with Julie James.” Now Julie utilizes a thrilling 3 ½ octave range with hilarious stories and songs to reveal a childhood obsession with jingles, theme songs and cast albums, as well as a performance background in opera and musical theatre that would ultimately lead her to her role at SiriusXM, where all of these elements combine into one incredible dream job. The audience will be treated to a celebrity guest interview & performance in a live, on-stage version of “Broadway Names”, plus a round of trivia in the spin-off “Broadway Games with Julie James” for a chance at cool swag and prizes. Past stars joining Julie on stage have been Tony & Emmy nominee John Tartaglia andAladdin Tony winner James Monroe Iglehart. Julie spills the showbiz beans in this special one-night-only event, with snappy stories and original songs sure to dazzle any music theatre lover. A fast-paced romp of a variety show with rollicking new songs and long-lost Broadway gems, the show is a delight for Broadway fans and pop-culture geeks alike. With new songs by long-time collaborator Aaron Hagan, Julie rolls back the radio curtain on what it takes to run the only 24-7 Broadway radio station in the world while juggling jingles for Howard Stern, working the Red Carpet at the Tonys, and recording chatfests with all her theatre heroes back at the SiriusXM studios. It’s a classic evening of favorite tunes with an unconventional style and surprising twists as Julie comes out to the world as the songstress, storyteller and comedienne she truly is. 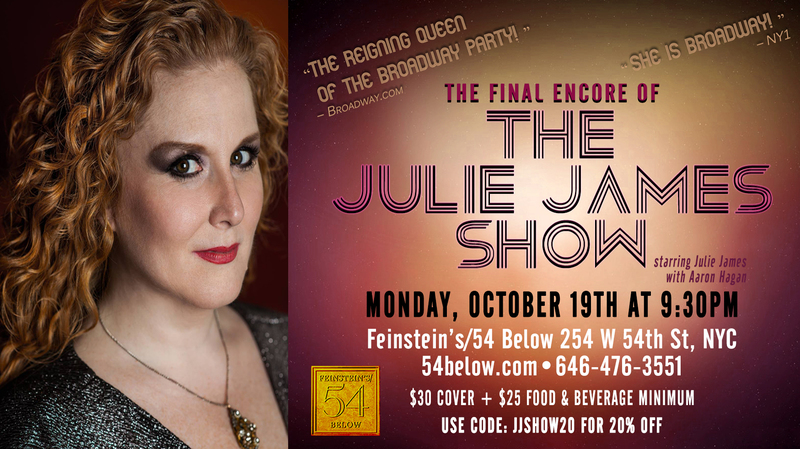 Julie James in “The Julie James Show” plays Feinstein’s/54 Below (254 West 54th Street) on Monday, Oct 19th at 9:30 PM. Cover charge begins at $30 with $25 food and beverage minimum. Tickets and information are available at http://www.54Below.com. Tickets on the day of performance after 4:00 are only available by calling(646) 476-3551. Julie James is an award-winning vocalist, theatre performer, voiceover artist and radio personality. Julie is the Program Director of Sirius XM Radio’s On Broadway and Metropolitan Opera Radio stations and hosts “Broadway Names with Julie James” where she takes her listeners on the town, backstage and into the studio for fun, lively conversations with the biggest and best of Broadway and beyond, including Hugh Jackman, Julie Andrews, Sting, Kristin Chenoweth, Rita Moreno, Neil Patrick Harris, Ben Vereen, Patti LuPone, Geoffrey Rush, Bernadette Peters, Daniel Radcliffe and many others. Julie has also performed internationally, singing the National Anthem at Fenway Park for a sold-out audience of 34,000, with the Indianapolis Symphony Orchestra, Cincinnati Opera, Goodspeed Opera House, Long Wharf Theatre, Cincinnati Playhouse in the Park, St. Louis Repertory Theatre, headlined at New York’s famed Central Park Summerstage, and in concert for the President of Kazakhstan. Julie has hosted hundreds of events across America for clients including Saks 5th Avenue, Bloomingdale’s, Macy’s, and Lord & Taylor, and she was the exclusive spokeswoman for Tommy Hilfiger Woman for two years. Julie’s personality, stage presence and vocal style brought her to SiriusXM Radio where her voice is heard by millions each day as a host and on voiceovers, jingles and parody songs for various channels and “The Howard Stern Show.” Her “Broadway Buzz” news updates air throughout the day on SiriusXm On Broadway channel 72, and “Broadway Names with Julie James” premieres Saturdays 8 PM ET with encores Sun 12 PM, Wed 7 AM & Thu 9 PM. FEINSTEIN’S/54 BELOW, Broadway’s Supper Club, is the new performance venue in the grand tradition of New York City nightlife. A few blocks from the heart of Times Square and just below the legendary Studio 54, 54 BELOW is a classically designed state-of-the art nightclub in the theatre district that hosts audiences with warmth and style. The venue provides a food and beverage menu from early evening through the wee hours of the morning that is worthy of the world-class entertainment on the stage. In their description of 54 BELOW, The New York Times writes “the club has the intimacy of a large living room with unimpeded views and impeccable sound; there is not a bad seat. Its sultry after-hours ambience is enhanced by brocade-patterned wall panels planted with orange-shaded lanterns. And the atmosphere is warmer and sexier than in Manhattan’s other major supper clubs.” Located at 254 West 54th Street, 54 BELOW features up to three shows nightly with cover charges ranging from $15-$95. Time Out NY Critics’ Pick: The best cabaret shows in NYC this week featuring The Julie James Show! Broadway scenester Julie James hosts a showtune-themed show on SiriusXM Radio, but she’s also an accomplished and engaging singer in her own right. In this reprise of her spring show, she looks back on a life of musical obsessions, and interviews a celebrity guest star. New York, NY (June 10, 2014) – Following a sold-out debut performance in March, Broadway personality and SiriusXM Radio “On Broadway” host Julie James will encore her new musical comedy, The Julie James Show, on Saturday, June 21st at 11 PM at 54 Below, it was announced today. To Broadway performers, fans and “On Broadway” listeners, Julie is best known as the effervescent host of “Broadway Names with Julie James.” Now Julie utilizes a thrilling 3 ½ octave range with hilarious stories and songs to reveal a childhood obsession with jingles, theme songs and cast albums, as well as a performance background in opera and musical theatre that would ultimately lead her to her role at SiriusXM, where all of these elements combine into one incredible dream job. Julie spills the showbiz beans in this special one-night-only event, with snappy stories and original songs sure to dazzle any music theatre lover. A fast-paced romp of a variety show with rollicking new songs, long-lost Broadway gems, and an impromptu visit with celebrities in the audience, the show is a delight for Broadway fans and pop-culture geeks alike. With new songs by long-time collaborator Aaron Hagan, Julie rolls back the radio curtain on what it takes to run the only 24-7 Broadway radio station in the world while juggling jingles for Howard Stern, working the Red Carpet at the Tonys, and recording chatfests with all her theatre heroes back at the SiriusXM studios. It’s a classic evening of favorite tunes with an unconventional style and surprising twists as Julie comes out to the world as the songstress, storyteller and comedienne she truly is. 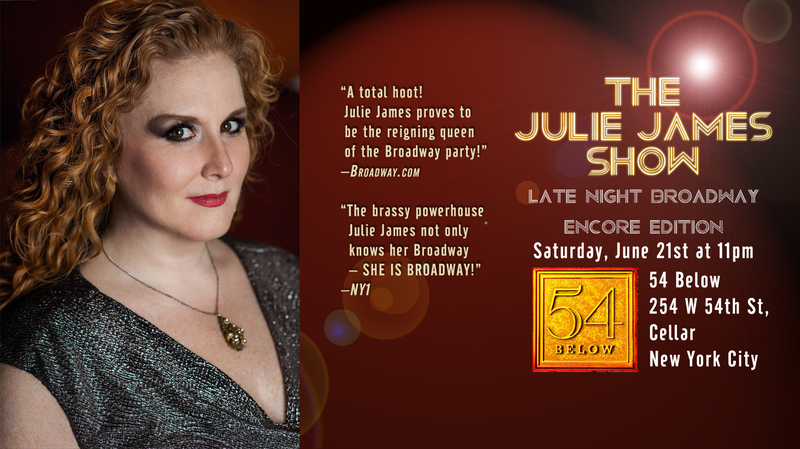 Julie James in “The Julie James Show” plays 54 Below (254 West 54th Street) on Saturday, June 21st at 11:00 PM. There is a $25-$35 cover charge and $25 food and beverage minimum. Tickets and information are available at http://www.54Below.com. Tickets on the day of performance after 4:00 are only available by calling (646) 476-3551. Julie James is an award-winning vocalist, theatre performer, voiceover artist and radio personality. Julie is the Program Director of SiriusXM Radio’s On Broadway and Metropolitan Opera Radio stations and hosts “Broadway Names with Julie James” where she takes her listeners on the town, backstage and into the studio for fun, lively conversations with the biggest and best of Broadway and beyond, including Hugh Jackman, Julie Andrews, Sting, Kristin Chenoweth, Rita Moreno, Ben Vereen, Patti LuPone, the Casts of “Smash” and “Glee,” Harry Connick, Jr. and many others. Julie has also performed internationally, singing the National Anthem at Fenway Park for an audience of 34,000, with the Indianapolis Symphony Orchestra, Cincinnati Opera, Goodspeed Opera House, Long Wharf Theatre, Cincinnati Playhouse in the Park, St. Louis Repertory Theatre, at New York’s famed Central Park Summerstage, even for the President of Kazakhstan. Julie has hosted hundreds of events across America for clients including Saks 5th Avenue, Bloomingdale’s, Macy’s, and Lord & Taylor, and she was the exclusive spokeswoman for Tommy Hilfiger Woman for two years.